On Tuesday, June 15th, I ran into Juan Juan Almeida in the International Legal Office on 21 24, El Vedado. As we said goodbye, he told me he was starting a hunger strike on that day demanding the exit permit to continue his medical treatment outside Cuba. I visited him twice at his apartment on 41 and Conill before August 23rd, when he suspended his fast at the request of the Archbishop of Havana, who interceded on his behalf before General Castro’s government. On Monday, August 23rd, Juan Juan seemed like the shadow of his shadow. In 69 days he went from 230 to 150 pounds. If it were not for his lucidity and good humor, I would have thought I was in the presence of a zombie. 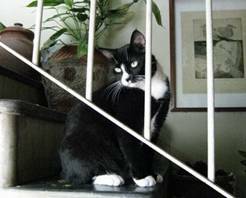 We talked for 20 minutes and I left before the arrival of his sister Glenda, who lives three blocks away and was keeping an eye on his hardships. As I walked along Tulipán looking for the bus that would take me home, I thought again about this striker: extraordinary, cheerful, making jokes, the enemy of any type of inflexibility, able to listen even to the delirious fantasies of the State Security agents who have been breathing down his neck since he lost the protection of his father, a comandante of the revolution with an artistic vocation and a passion for power. 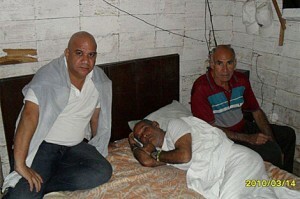 During his hunger strike, Juan Juan made statements to the foreign press accredited in Cuba, spoke with several bloggers and independent journalists, went out with signs to public places two or three times, received friends and people who oppose the regime, was the subject of controversy and attacks and political asylum proposals from governments in Europe and America. For a great part of the world it is difficult to understand that a man would begin a hunger strike because he is not allowed to leave his country to continue the treatment he was receiving in Europe. It has a certain logic, since adults decide what to do with their lives, except in the case of Cuba and North Korea, where the State attributes to itself the authority to decide who enters or leaves the country. 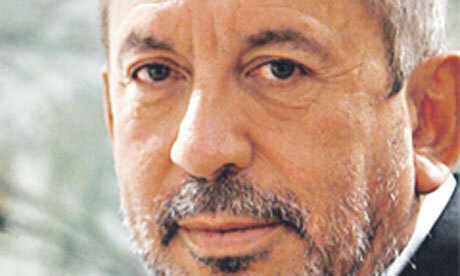 For a segment of Cubans in exile, Juan Juan Almeida is loathsome due to his paternal origin. He has Castroism’s stamp of origin; he was educated as an officer of the Minister of Internal Security in the former Soviet Union and practiced his profession until he fell into disgrace. Perhaps he´s not forgiven for the publication of a book in which he satirizes his own life and the errors and horrors of the demigods who took hold of power and devour their own children. I don´t think he worries much about the conflicting opinions of those who judge him through a political lens. Juan did not distance himself from the power circle in order to climb in the opposition. As I listened to him on Monday, August 23rd, I thought that this charismatic and cheerful down-to-earth Cuban believes more in the smile and the handshake of those who greet him than in all the slogans and hallelujahs he heard since he was born. 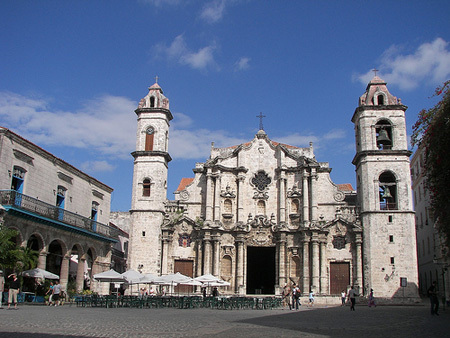 As in medieval times, when music, painting and other artistic expressions were under the wing of the Catholic church, in Cuba culture is sponsored by the State. But artists don’t knock on the doors of cathedrals nor present their projects to the despot, since there is a network of institutions that rule and control film, the performing arts, the plastic arts, books and literature, architecture and even the media. I was thinking of the subjection of culture to the State on Monday, August 23rd, as I enjoyed the concert offered by Zenaida Romeu and her Camerata before the power elite, in honor of the 50th anniversary of the Federation of Cuban Women, created by the former First Lady to empower the females of the country. Zenaida’s words as she presented each piece caught my attention. With delicacy and precision she spoke of music as an expression of liberty. I suppose that General Castro and his entourage did not notice that detail. Enveloped in the interpretive magic of these women, they were not attentive to these subtleties. Many of our creative people sometimes act on stages that reaffirm the relationship between art and power. The Universal Hall of the Armed Forces, the steps of the University of Havana, the Plaza of the Revolution or the Black Flags Park on the Malecón, in front of the United States’ Interests Office, are only some of the ritual places. It is almost impossible to control the manifestations of art and literature, since creation is a natural need of man as a social being. The predominance of the State can achieve, at most, that an intellectual elite, docile and well-trained, direct culture toward political ends. With the revolutionary process started in 1959, culture continued its march, but its rhythm was changed. In half a century of messianic populism, several components of daily life and tangible and spiritual elements of the social dynamic were altered. 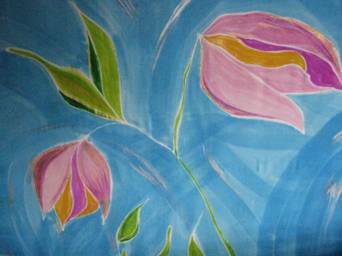 There are reversible damages and representative faces of “revolutionary art”. Upon the disruption of the social order, the sociopolitical scheme was changed. The association with the socialist model led by the former Soviet Union made way for the development of official organizations that monopolize each area of artistic creation. The Instituto Cubano del Libro (Cuban Books Institute), the Centro Nacional de la Música (National Music Center), the Instituto de Arte e Industria Cinematográfica (Institute of Film Arts and Industry), the Consejo de las Artes Escénicas (Performing Arts Council), the Instituto de la Radio y la Televisión (Radio and Television Institute), the Centro de Artes Plásticas y Diseño (Plastic Arts and Design Institute) and other groups direct the artistic production according to political and government interests. The commissaries dictated standards, demanded fidelity, and imposed mass culture through control of the radio, film, education and the media; but the creative universe of the island went into crisis around 1990, with the fall of the socialist allies that provided the resources for the country, accelerating the exodus of artists to other countries. But the bureaucratization of culture was maintained, intent on tying the creators to the network of State centers that instituted censorship and submission through awards, publication, recordings and travel, favoring opportunists and excluding those who defy the doctrine of the power holders. Many public shows take place in this context of political schemes, as in the times of praising and singing to the Lord, when music and other artistic expressions revolved around the cathedral and the artists were dependent on generous patrons. The 58th edition of “Poland Today”, a periodical written and edited by the Polish Embassy in Havana, is already in libraries and national institutions. 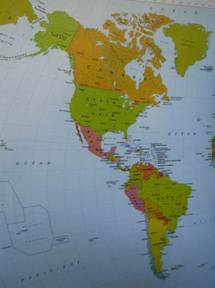 It is structured in specific sections such as current events, culture, politics, the Man and society, economics, science and Polish cooking. It is published three times a year, the 58th edition is the second of 2010. In the January-March issue we learned about the celebration for the 200 year anniversary of Polish composer and pianist Frederic Chopin (1810-1849) who is considered one of the greatest creators of music for the piano of all time. As part of the festivities honoring the musician, the Wielki-Opera Ponznan theater put on a show titled “Waiting for Chopin” at the San Felipe de Neri church. The show is inspired by the desire to visit and present little known works of the composer; his poor state of health prevented him from traveling to many countries. The performance also welcomed the exhibit titled “Chopin in Cuba” which includes nine portraits of the artist by nine contemporary Cuban painters. The exhibit had already been shown for the first time at the Amadeo Roldan Theater during Frank Fernandez’s concert, which inaugurated the Chopin Year in Cuba. The Numismatic Museum was able to present the “Numismatic Exhibit” due to a loan from the Polish Mint. The exhibit included the institution’s most interesting coins. One could see coins from Poland, Russia, Armenia and Andorra. The exhibit also included one of the smallest coins in the world, which weights a mere gram and holds a portrait of Frederick Chopin. Other novelties included pieces with encrusted amber and other precious metals and some that depict reproductions of famous paintings from Van Gogh and Leonardo da Vinci. From the April-June edition of the bulletin we also learned about projects for public buildings in Poland, whose advanced technological design will make them paradigms of reference in the cities where they are erected. In this latest edition, much to the dismay of Caribbean male chauvinism, we found out about an activist for male rights. This person has a unique way of making his claims. With a long beard and a machista attitude, without being a homosexual or a transvestite, he dresses in a petticoat and high heels, even inside his home. And so he makes fun of the stereotypes associated with the male gender in society. The relationship between Poland and Cuba can be traced back to the 19th century. Let’s remember that Carlos Roloff from Poland participated in our independence struggles and reached the rank of general. Later, when the Republic was formed he was conferred Cuban citizenship. In keeping with this historical precedent, every year Poland organizes a week of cinema in Cuba which includes exhibits, conferences, theater workshops and other events. Their socio-cultural projects are a valuable contribution to the development and consolidation of civil society in our country. Author Translating CubaPosted on September 3, 2010 December 18, 2017 Categories Eugenio Leal, Translator: Lita Q. “Our daily bread”, as they call it, will no longer be on the ration booklet, nor will it cost the current five centavos; as the cause of hypertension and weight gain, those who want to — and can, will have to buy it for 80 centavos. Whereas before you’d spend one peso and 50 centavos monthly per person on bread, now you’ll spend 24 pesos for the same amount. Cigarettes, those survivors of an era when smoking was a pleasure, were only alloted to those born before 1958, and since they cause cancer, they’ll also be withdrawn from the rationing system. Even coffee, where blended coffee for 10 centavos per four-ounce pack was switched out on us for a supposedly purer coffee at five pesos for the same pack, now it’s also rumored that it will be decreased in the libreta de abastecimientos (national ration booklet of supplies), due to its effects on insomnia and gastritis. At three years of age they take away baby food, whose sugar content predisposes you to diabetes. At age seven they substitute soy yogurt for milk, the cause of excess calcification. 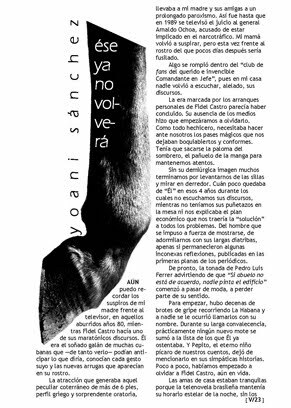 At age 13, the monthly quota of picadillo (ground beef), which was instituted some two years ago as a result of a national study on the size and weight of our children, but it turns out it could lead to gout, so, along with the soy yogurt, it is also taken away. Now they have decreased the allocations of sugar and salt, poisons, as we all know. They don’t offer red meat on the ration booklet; only soy and dark meat picadillo, and you can find chicken and sometimes mackerel. All of that and more can be found in the foreign currency stores, but the government is interested in the health of the people, not the health of sturdy tycoons bursting with CUCs (the acronym for convertible pesos). We’ll all die healthy. Author Translating CubaPosted on September 2, 2010 December 18, 2017 Categories Rebeca Monzo, Translator: Lita Q. There are a few journalists on the TV News Broadcast that seem to be the only ones authorized to do critical reporting, whether it be about a construction site or about a hospital. On last Tuesday’s nightly news, the source of indignation of one of these reporters was the distribution of agricultural products on behalf of the designated entity known as Acopio. The camera panned an impressive amount of deteriorated or rotten agricultural products. But the best were the interviews. The farmers were protesting because Acopio had told them that they could not continue harvesting; the executives told them there are problems with transport, and here comes the best part, they added that the market is saturated. Since the state-run market is not regulated naturally, the saturation of products is caused by the high prices. I watched the report. The agricultural products… us… and always a boss with justifications. Author Translating CubaPosted on September 1, 2010 Categories Regina Coyula, Translator: Raul G.
As I look at a map of Cuba, I can’t help but wonder about how, in the 21st century, an island that is so close to the country which exhibits the greatest digital advancement, can be traveling in the opposite direction. From Villa Clara to the tip of Maisi there are only two hotels which offer internet service for Cubans who do not have foreign passports, in other words for Cubans with ID cards. These locations are found in Santiago de Cuba and Guantanamo, and their rates are 6 CUC per hour. They have very low connectivity and some sites, which the government considers harmful, are blocked. The attentive receptionists in the famous tourist spot of Guardalavaca in Holguin explain to me that in all the dozens of hotels and Bungalow Villas of my province I do not have the opportunity to connect to the internet if I’m not staying in these lodges. But, if I were to be checked in to one of these resorts, with the magical passport and foreign residence card, I’d have to pay no less than 50 CUC for just one day. There is also no luck in the hotel chains known as Club Amigos, Las Brisas, or Costa Verde, which are symbols of international hostels which particularly exclude Cuban citizens from any rights to enjoy warm sands, computer rooms, or basic cafeteria services. Every city on the island has Points of Tele-Selection with the ETECSA companies. They are commercial offices which also reserve the right to only admit people who possess some documents that prove foreign citizenship or residence. However, about a little over a year ago they opened a locale which has proven to be surprisingly busy. In them, you can see a long line of guys and girls who await their turn to exchange e-mails with foreign friends whom they have met in the hotels previously mentioned. Let me explain: For 1 CUC they are allowed to open an e-mail account from a national server that will not have well known extensions like g-mail or yahoo, but which will have the .cu extension, from which they will only be able to read and respond to their almost always flirtatious remarks. There, they cannot use any sorts of devices like flash drives or CDs. For 0.50 cents CUC they can spend an hour trying to exchange messages with the outside world under very strict vigilance on the part of the information functionaries which ETECSA and the G2 position there to watch over the users. Those girls could pass with their foreign boyfriends and friends to hotels, make them spend a fortune on internal services, but when they leave, they have to return to the tourist apartheid. The game is tight, as the saying goes. Now, Cubacel holds the right to allow, or not to allow, people to use Twitter through cell phones in Cuba. Those of us who are nonconformists and chose to protest, are also bound to lose this time around. Author Translating CubaPosted on September 1, 2010 December 18, 2017 Categories Luis Felipe Rojas, Translator: Raul G.
Chilean businessman Joel Max Marambio Rodríguez faces a deadline of August 23rd to appear before the Inspector from the Ministry of the Interior (MININT), Lieutenant Colonel Francisco Miguel Estrada Portales. If he does not appear before the time runs, the criminal proceedings initiated against him could proceed to a final judgment of guilt. How does an intimate friend and protegé of the elder Castro reach this point, managing the business of a holding company that moves more than 100 million dollars a year? Why would a friend of the revolution for more than 40 years become its adversary? There are still many unanswered questions, some of which will be answered in the course of the trial, where the Chilean businessman will apparently be tried in absentia and evidently he holds the key to the box of secrets. Marambio, age 63, a former bodyguard of ousted President Salvador Allende and former friend of Fidel Castro, is accused by the Cuban government of the crimes of bribery, acts detrimental to economic activity or employment, embezzlement, falsification of banking and commerce documents, and fraud. The businessman, owner of International Network Group (ING), was a partner of the Cuban state in the joint venture “Río Zaza Foods,” specializing in the production of juices, dairy products, and alcoholic beverages for the Cuban market and abroad. In late 2009, the Auditor General, a state body subordinate to the State Council, chaired by Army General Raul Castro, began investigating the leftist entrepreneur’s businesses on the island. Unofficially, he was linked to a corruption scandal involving the deposed director of the Institute of Civil Aeronautics of Cuba (IACC) and Major General Rogelio Acevedo.. Max Marambio and his brother Marcel, were also partners of the IACC in the Sol y Son tourist agency. Several directors of the company were arrested, accused of paying kickbacks, misappropriating funds, and diverting resources abroad. Lucy Leal, executive director of ING, was arrested and is being investigated. Authorities have not officially said anything about the scandal. In April, however, they acknowledged that Marambio’s companies were under investigation, when one of the managers of Rio Zaza Foods, the Chilean Roberto Baudrand, age 59, under house arrest and being subjected to interrogation, was found dead in his apartment. The Cuban autopsy, accepted by the family of the deceased, said the cause of death was respiratory failure combined with the consumption of drugs and alcohol. 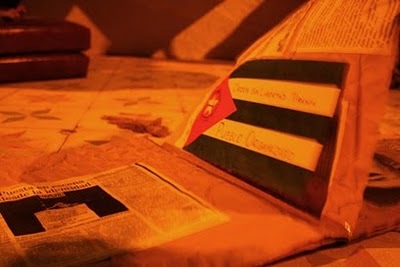 Marambio, known in Cuba as “The Guaton” (the fat man) was summoned and questioned by Inspector Estrada Portales, in late April and early August. The officer is in charge of the investigation. The summonses were published by means of two MININT notices in the Official Gazette of the Republic of Cuba, the agency that discloses the laws and governmental acts on the island. To date, he has not appeared. The Summons was issued on July 19. In it, the MININT inspector summoned the Chilean businessman to appear before him on the 29th, warning him that if he did not appear on the date indicated, an indictment would be issued on August 3. Officer Estrada Portales ordered the police agencies and State Security to search for, apprehend, and present Marambio within 20 days. The summons expires on August 23rd. If the deadline passes without his appearance or presentation, he will be declared in default. In the case of crimes against the fundamental political or economic interests of the nation, the Cuban judicial system provides that proceedings against a defendant declared in default can proceed to a final decision. The judicial system in Cuba offers few safeguards for defendants. The criminal case against him is in the preparatory phase, when pretrial proceedings are conducted. If Marambio returns to the island he is most likely to end up in jail, as a precautionary measure to secure his appearance. Until then, he cannot appoint a legal representative for his defense. Everything seems to indicate that the legal route will be the means of settling accounts. The publication of the summons and indictment in the Official Gazette of the Republic of Cuba is a formal requirement. The island’s government does not intend to pursue the businessman internationally. The aim is to declare him in default and try him in absentia. In that case, he could appoint a lawyer. He could also appear at any time and revoke the declaration. He could even void the final judgment against him and be heard in a new trial. Marambio could be a time bomb for the Castro brothers. For what he knows and for what he has been quiet about. We suspect he will not return. Author Translating CubaPosted on September 1, 2010 September 1, 2010 Categories Ivan Garcia, Laritza Diversent, Translator: Tomás A. 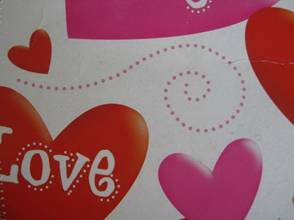 In recent times the postal parcels from overseas sent to Cubans who publicly express disagreement with the government are being confiscated. The Post Customs, an entity belonging to the General Customs of the Republic has been using the seizures of shipments originating from foreign countries as a filter applied to the dissidents. My own case can serve as an example. 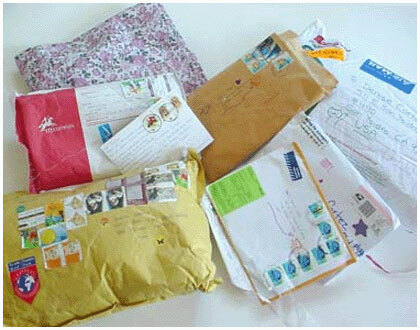 In less than two months they confiscated two parcels sent to me from the United States. I was notified of the most recent of these on August 13th by means of Confiscation Order No. 1209 from the 29th of July and a document of Retention and Notification, both signed by Danny Samanda Rivero, a Customs Control inspector. If this happens once, it could be a coincidence. The second time it could be seen as an act of cruelty. But if the same thing also occurs to other persons sharing your political views then it is a case of state policy. A subtle way to punish those who dare question the system. Undoubtedly, the administrative measure has a political background. The list of the affected ones includes Yoani Sánchez, Silvio Benítez, Dania Virgen García, Ubaldo Manuel León, Yusnaimy Jorge, Aini Martín, Vladimir Alejo y Julio Beltrán Iglesias, among other opponents of the regime. According to inspector Samanda Rivero, the content of the package addressed to me “put the general national interest at risk.” He ordered the confiscation invoking Resolution No. 5-96 of the Head of the General Customs of the Republic. The first confiscation on June 8th was effected by Confiscation Order No. 978. Raimundo Pérez García, a Customs Control inspector, seized the parcel using the same argument. The Resolution No. 5 of the General Customs, effective since 1996, allows the application within the country of the Convention for the suppression of the circulation of, and traffic in, obscene publications. Furthermore it bans the sending of “any object with content considered to be contrary to the morality, the proper conduct or the general interest of the nation.” Moreover, it stipulates that the confiscated goods are to be turned over to the Interior Ministry. In both confiscation orders enforced against me the inspectors Pérez García and Samada Rivero failed to explain how those imported items “affect the general interest of the nation.” The two confiscated packages contained something like: an MP3 player, a photo camera, pencils, ballpoint pens, pencil sharpeners, notebooks, wax crayons, balloons, toilet soap, disposable razors, deodorants, plasters, toothbrush and toothpaste. All of these are products sold in state and convertible peso shops on the Island. At the end of July I lodged an appeal before the Head of the Posts Customs requesting the first confiscation order be overturned. Dated August 17th I was notified of the Appeal Resolution No. 231 of 2010 that dismissed my claim. The official, Raúl Gómez Badía, the highest authority of the institution deemed the measure imposed by inspector Pérez García appropriate. After having exhausted all available administrative remedies my next step will be to assert my rights before the courts. Although the “new customs offensive” may have another objective. To destroy the hesitant attempts to reestablish the communications between Cuba and the United States. The confiscated goods were sent to me from the northern country by the Universal Postal Service agency of the Office of International Exchange. On September 17th 2009, Cuban and United States representatives initiated talks in Havana that envisioned the resumption of direct postal services between both countries. At the end of the meeting that took place under much secrecy the Cuban delegation issued a statement. It´s worth making it clear that the majority of Cubans don´t think highly of the customs services, above all of those at the airports. 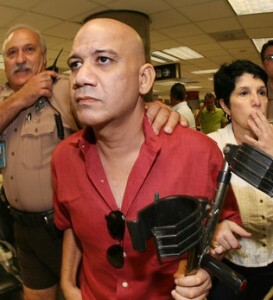 A proof of this is the video Abuse at the Cuban Customs by the acclaimed composer and singer Cándido Fabré. Fidel Castro loves to make references to the numerous economic, paramilitary, and political aggressions of the 11 administrations that have been through the White House throughout these 51 years the strong-man of Cuba has been in power. The United States is far from being the ideal neighbor. In the first 40 years of the revolution, it unleashed a ferocious campaign of assaults on Castro. It was an all out fight with all the ingredients. Dirty war, economic pressure, and anti-government propaganda. But Castro is no saint either. Strengthened by more then 20 million rubles that Moscow granted him, he served as the Russian’s aircraft carrier in the Caribbean. In October of 1962, he made the unfortunate decision of accepting 42 intermediate- and medium-range nuclear missiles equipped with nuclear warheads, strategic bomber aircraft, and 43,000 Russian soldiers on Cuban territory. He financed numerous guerrilla groups in Latin America and Africa, including some that, years later, have degenerated into terrorist gangs such as the FARC in Colombia and Shining Path in Peru. On top of provoking the thunderous collapse of the Cuban economy, with his absurd plans and his method of managing the country as if it were his own private estate, the extraordinary comandante maintained military troops thousands of miles away from this island. He acted as if possessed by a tropical Napoleon complex. Cuba got involved in the civil wars of Angola, Ethiopia, and Somalia. The consequences of our participation in those conflicts have yet to be written about. During the Cold War, Cuba and the United States maintained a mutually irritating political rivalry. As a center of global power, Washington didn’t want to allow an openly Soviet military presence and, on the part of the government in Havana, support for insurgencies around half of the planet . After Khrushchev withdrew the missiles, the now vanished USSR maintained troops on the island and a base for electronic spying on North America. With the fall of the Berlin Wall in 1989, Cuba lost its steam. Once the pipeline of Russian rubles was sealed up, we entered into a period of economic poverty. The Americans plopped down on a recliner to await the fall. But against all winds and tides, Castro resisted. Now, the world isn’t the same. Even Hugo Chávez and Evo Morales reached power through votes, not through bullets. Ernesto Guevara’s theory of “Revolutionary Focalism” has been tossed into the sack of obscurity. The theater of action presents a new design. The elderly warrior that miraculously escaped death in July of 2006, has reemerged, transformed into a kind of international guru, predicting catastrophes and lending credence to any old incendiary conspiracy theory. Only on the immigration issue is Cuba a national security problem for the United States. A hypothetical internal crisis could unravel whereupon thousands of people would hurl themselves into the sea on any floating object to escape the island. The White House is the most interested party in the Cuba situation not getting out of its government’s control. In spite of Castro’s anti-yankee discourse, today the United States is the island’s fifth trading partner and first in foodstuff sales. We hear talk of the ban on travel from the United States to Cuba being lifted. The embargo is an absurdity. In the foreign currency stores they sell Coca-Cola and Dell computers, among other products. The biggest of Cubans’ problems don’t come from the North. The enemy sleeps among us at home. Rampant corruption and economic inefficiency are, among others, the causes the nation is treading water neck-deep. Fidel Castro attempts to blame the gringos for many of our calamities, but sensible people here believe that bad governance and the system’s inoperability are the most responsible. On top of being a current minor evil, the United States contributes financial liquidity to Cuba: 100 million dollars annually by way of family remittances and 50,000 Cuban-Americans who travel to the island every year and spend dollars at full throttle. But it’s always easier to pin the blame on the same old lifelong villain. If the United States hadn’t existed, Fidel Castro would have invented it. Photo: Ralph Crane, Life Magazine, October of 1962. In a store in Los Angeles, people follow the news of the naval blockade against Cuba authorized by Pres. 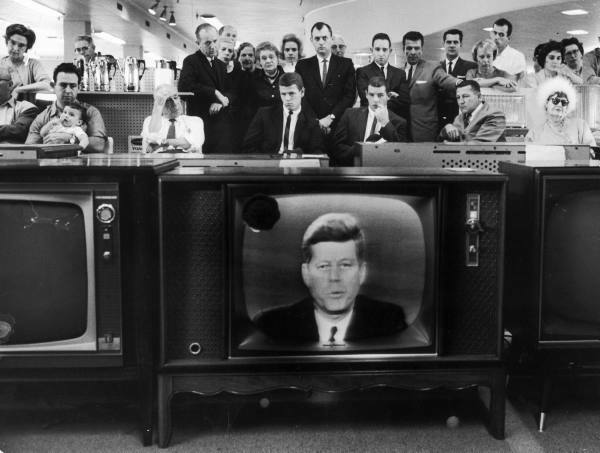 Kennedy during the Cuban Missile Crisis. A free magazine can be invented over the dusty cartridge of an empty cement sack, opened. In fact, freedom can be just that: a recycled powder, a remnant, with the rhetoric of its aired texts, without more design than that of a pragmatic parchment. And the gates of the fringe theater group EL CIERVO ENCANTADO (5th and D, Vedado) served as coliseum for this somewhat eccentric experience: to cut up a cement sack and construct a personal magazine, live (Made in Omar Pérez + Yornel) by means of collage, cut-up, and cut & paste (preschool techniques borrowed by intellectuality). This past July’s Saturday the 31st, the late night of El Vedado had in that corner a breather from the police oppression that smolders our avenues, on the hunt for an identification card or an island beating (under the digital cameras hanging from lampposts, perhaps by their necks). “P350”: that’s the name of the Cuban Portland cement and it’s also a magazine that already accumulates a few collection bags. Concrete creativity. In a special space where the prize-winning filmmaker Enrique Pineda Barnet fits right along with the censured performer Luis Eligio Pérez (from OMNI ZONA FRANCA). Even I. The fossilized functionaries of the Ministry of Culture never peek their naphtha noses around there. They’re afraid of the democratic nobility and the enchantment of a theatrical stag. It’s just that they have quinquennials of experience closing down editorial projects, from El Puente, to Pensamiento Crítico, even Albur y Diáspora(s). It’s time that they retire or resign from some of their subcommitments of second-fiddle censor. But P350 will be hard to fetter. 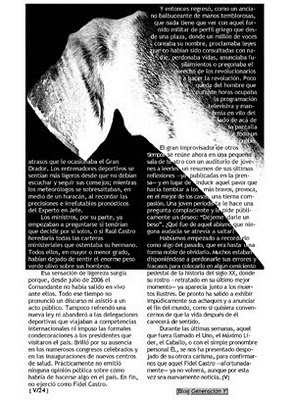 The artists Omar Pérez and Yornel simply do not distribute it. They make it and then they exhibit it, carrying their cartons from home to home, like construction snails. Besides, they don’t even do it themselves, but they invite any creator to get in there and get their hands dirty so they can become smeared in the liberty of authorship. Do it yourself…! P350 is a magazine that, as it gets stronger, like the original cement of its buttress, I’m sure will stick on the throats of more than one Cubanesque hooligan of guayabera and bureau. 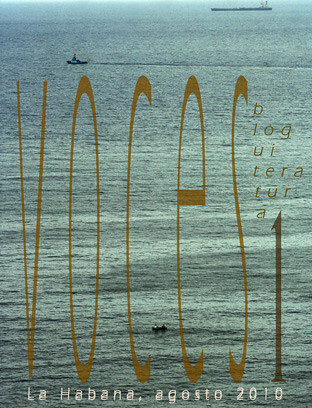 VOCES, originally uploaded by orlandoluispardolazo. A document circulates Havana, it surrounds it. A dossier of dissimilar discourse, in and out of Cuba. A score of writers, and a window for looking in and out of Cuba. Voices of change and continuity, swift to the point of the implausible. Unedited and recycled, unheard on paper as well as on screen. in its nonsensical notion of nation. Ways of narrating our unideological idleness at the height of the 21st century. than of expectancy. Bullet-in of blogiterature. author at the edge of all authority. I CAN STILL remember my mother’s sighs in front of the television, during those boring eighties, while Fidel Castro gave one of his marathonian speeches. He was the dreamy stud of many Cuban women who—from seeing him so much—could anticipate what he would say, they knew each of his gestures, even the new wrinkles that appeared on his face. The attraction which that peculiar countryman of more that six feet, Grecian profile, and surprising oratory generated, took my mother and her friends into a prolonged paroxysm. It was like that until, in 1989, Arnaldo Ochoa’s trial was televised. He was accused of being involved with drug trafficking. My mother sighed once again, but this time opposite the face of the one who would be executed in a few days. Something was broken within the “fan-club of the beloved and invincible Commander-in-Chief,” because in my house, nobody again listened stupefied to his speeches. The age marked by Fidel Castro’s personal tantrums seemed to end. His absence in the media made us begin to forget him. Like every sorcerer, he needed to perform his magical moves for us, leaving us widemouthed and contented. He had to take the rabbit out of the hat and the scarf out of the sleeve in order to keep our attention. Without his demiurgic image many of us ended up leaving our chairs and looking around. How little remained of “Him” in those four years during which we did not hear his speeches, when we didn’t have his punches on the table and his explanations of how the economic plan would bring the “solution” to all problems. Of the man who imposed himself with the strength of his presence, of the lulling us with his long diatribes, some unconnected reflections barely remained, published on the front pages of newspapers. Suddenly, Pedro Luis Ferrer’s tune, warning us that “If grandpa does not agree, nobody paints the building” began to go out of style, to lose part of its meaning. For starters, there were dozens of flu outbreaks going around Havana, and nobody thought of calling them by his name. During his long convalescence, practically no new nickname was added to the list of the ones He already held. And Pepito, the eternal rascal of our jokes, stopped mentioning him in his funny stories. Little by little, we had begun to forget Fidel Castro, even while he was still alive. Homemakers were calm because the Brazilian soap opera kept its stellar nighttime time slot, without the delays that the Great Orator caused. The sports coaches felt lighter since they didn’t have to listen and follow his advice; meanwhile the meteorologists got startled, in the middle of a hurricane, when remembering the precise and irrefutable forecasts of the Expert in Chief. The ministers, on their part, began to wonder if they had to make decisions for themselves, of if Raul Castro would inherit all the cabinet positions that his brother held. All of them, to some large or small degree, had stopped feeling the huge olive-green weight on his shoulders. That sensation of lightness came about because since July, 2006, the Commander had not shown himself alive in front of them. All that time he did not give a speech or attend a public event. Neither did he approve a new law nor champion the sports delegations that traveled to international competitions nor sponsor the formal decorations to the presidents that visited the country. He was conspicuous by his absence in the numerous congresses celebrated and in the inaugurations of the new health centers. He practically did not utter any political opinion over how things had to be done in the country. Ultimately, he did not act like Fidel Castro. And then he returned, like a blabbering elder with shaky hands that had nothing to do with that once well-built military man of Grecian profile, who from a plaza, where a million voices chanted his name, proclaimed laws that hadn’t been consulted with anyone, pardoned death penalties, announced executions or proclaimed the right of revolutionaries to make revolution. Little is left of the man who for hours took over television programming and kept an entire nation on the edge of their seats. The great improviser of other times assembles now in a little theatre with an audience of young people, to read the summary of his last reflections—already published in the press—and instead of inducing that old dread that made the bravest tremble, he provokes, at best, a tender compassion. A young journalist asks an indulgent question and publicly bids him for a wish: Would you let me give you a kiss? What of that abyss that no audacity dared jump? We had begun to remember him like something of the past, it was even a noble way of forgetting him. Many were willing to forgive his mistakes and failures in order to place him in some cindered pedestal of 20th century history, where his face—photographed in his last best moment—already appeared next to the illustrious dead. Suddenly he has come out to lewdly exhibit his ailments and announce the end of the world, as if he wanted to convince us that life after him will lose all meaning. During recent weeks, he who once was called the One, the Highest Leader, the Horse, or with the simple personal pronoun HIM, has presented himself to us stripped of his former charisma, to confirm that the other Fidel Castro—fortunately—will not return again, even if this time, he makes the news again.